The Smart Trike Dream line holds some outstanding features including a swivel wheel that can allow you to steer with one finger. This fantastic tricycle has durable double injection wheels with soft impact rubber and front suspension enabling to manoeuvre the trike smoothly. It can be adapted as your child grows and their level of ability improves. See below assembly video. Swivel wheel that can allow you to steer with one finger. This toy costs approximately £99.99 (for the latest and best prices make sure you check our retailer list for the Smart Trike Dream Green above). 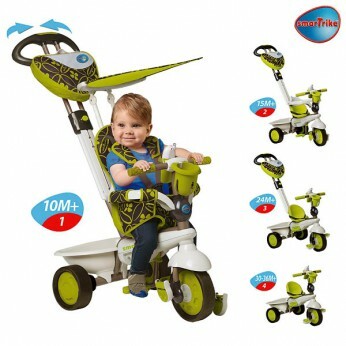 In our review of Smart Trike Dream Green we classed it as being suitable for ages 1 to 3 years but recommend you check the manufacturer specific advice before purchasing.